Today I’m starting a new series on the ole’ blog. 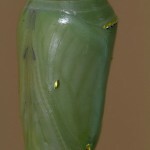 Over the next few weeks we will follow the life cycle of a monarch butterfly from egg, to caterpillar, to pupa, to butterfly. I watched this life-cycle a lot as a kid and I’ve been wanting to do a series here for some time to share this amazing experience with you. 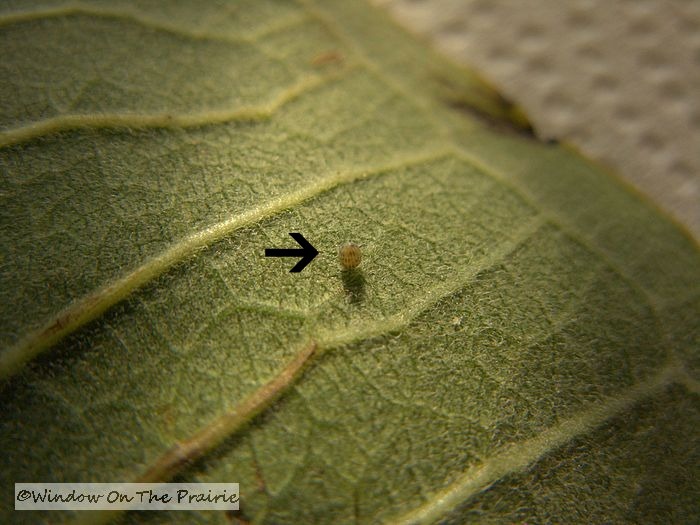 When a female monarch butterfly is ready to start a family, she lays her eggs on the underside of the leaves of the milkweed plant, one egg per leaf, and then flutters away leaving her kids to their fate. She has several hundred eggs to lay, so this alone will keep her busy. On Thursday evening, Harland and I went looking for eggs, and finally found this tiny egg. It only measures about a 1/16 of an inch. 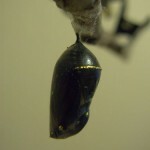 From the time the egg is laid until it hatches is only 4 days. So, tune in next Monday to meet our little caterpillar. 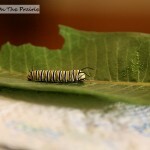 See Monarch Monday – Week 2. You can bet I’m gonna love this series. Have never seen it happen. You’d think I would have, living on a farm and being in the fields all the time! They are kinda secretive and hang out on the underside of the leaves so they’re hard to see unless you’re looking for them. This is going to be great! but now, you’ve got me excited to go out and find an egg with my kids. we have milkweed growing on our property. I. must. go. investigate!!! Looking forward to seeing all of your photos of the whole process! I am so glad I found your blog way back when…there’s always something interesting going on here! Absolutely, go look for eggs. Just keep turning over the leaves, I’m sure you’ll find some this time of year. Have fun! This is going to be an interesting series. Can’t wait to see it! What fun…I just forwarded this to my daughter-in-law for the grandkids to have a treasure hunt for the egg…. OH Great! It’ll be a wonderful learning experience for them. Thanks Laura. I’ve never seen an egg before and known what it was. 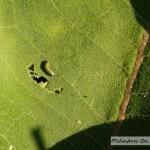 I found several eggs over the weekend on my milkweed plant. .wondering if that was what they were. .but I was expecting them to look more like squash bug eggs. I will have to go look at the plant again and see what is going on now! !Thanks for the great post! You’re welcome Melanie. Happy egg hunting! What t a cool idea. I look forward to seeing it “series”. I will have to share this with my second graders. We study the life cycle. Thanks for sharing. You’re welcome Peggy. I can’t wait to share this with everyone.